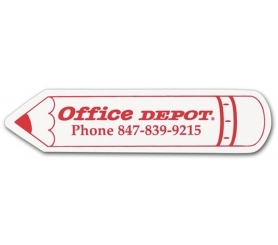 A 1.25x5 pencil shape school magnet can be utilized by school authorities for relegating short information about some events or as a fundraiser token. This magnet will surely catch parents and students attention because the pencil is an inevitable element in their life. This magnet can be easily personalized against the payment of $0.08. This magnet makes a good refrigerator promotion tool. Product Size : 1.25" x 5"